TELADATA is looking for Sponsors for our upcoming Technology Convergence Conference. The event’s great location and enhanced focus on attracting IT and Facilities decision makers has created a marketing opportunity you cannot afford to miss! Over 600 IT, Facilities, Data Center professionals, and CIO ’s from the high tech, legal, financial, health care, government, life science, educational, and entertainment industries will attend the event. Gain exposure to over 20,000 IT, Facilities, and Data Center professionals from e-mail campaigns and other marketing promotions. Company recognition on the Technology Convergence web site. The web site averages over 3,000 visitors per event. There will also be a link from the event web site to your company web site. 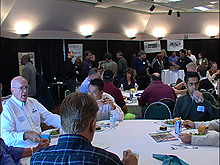 The unique format of the event encourages networking and provides the ability to speak with future customers in a comfortable setting. Platinum sponsors will have the opportunity to host a round table session with attendees during lunch to discuss key issues and create a meaningful exchange. Cost-effective local event that is held in the heart of Silicon Valley. "I am truly impressed with the conference. From the excellent presentations that were offered, to keeping them all on track time wise, to the amazing amount of attendees that came to visit my booth and beyond! I was able to meet and speak with many important major contacts in my industry and will be busy following up with each of them in the weeks ahead. I will definitely be a participant again next year!"